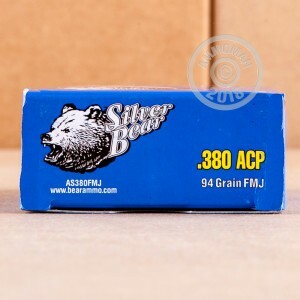 Get ready for some serious trigger time with this 1,000 round case of .380 ACP Silver Bear ammo. These cartridges are an affordable practice load for popular .380 carry pistols like the Ruger LCP, Glock 42, Bersa Thunder, and Kel-Tec P380. These rounds fire a 94 grain bimetal jacketed bullet at about 1,000 feet per second, making them a realistic proxy for "full-power" defensive ammo. 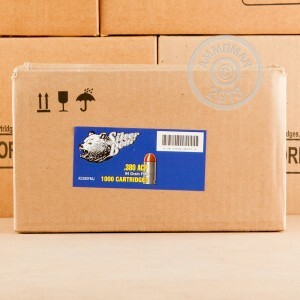 Like other Silver Bear ammo, they use non-corrosive Berdan primers and nonreloadable zinc-plated steel cases. Silver Bear ammo is manufactured in Russia at the Barnaul Machine Plant, a well-known industrial complex that supplied half of the Soviet military's ammunition during World War II. 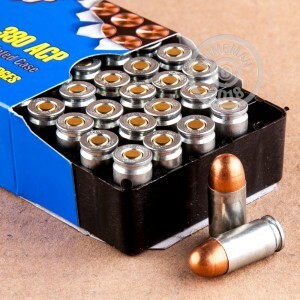 Buy this 1,000 round case or check out our other case-priced ammo to save big on shipping at AmmoMan.com! Simply place an order for $99 or more today to qualify. I'm just getting back into guns/shooting. I bought this ammo to go with a new gun. I spent a LOT of time and money thinking there was something wrong with my pistol. Nope. It was the ammo. Pistol works FINE with ANY other ammo. But it jams/misfires about 1 out of 7 rounds with this ammo. I've had to dislodge a few bullets from the barrel. Good thing I'm not an idiot, or I would have blown my hand off trying to use this cheap ammo. You get what you pay for.